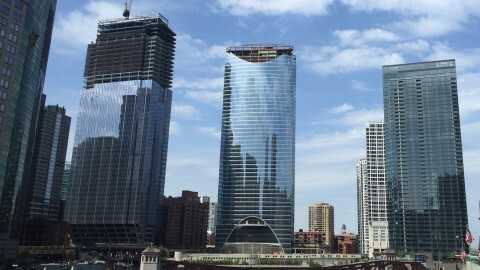 Gravity-defying 150 North Riverside has already taken its rightful place among Chicago’s architectural and engineering wonders. For almost 80 years, the 2-acre site where 150 North Riverside now stands was considered too troublesome for construction. Active railroad tracks run through the narrow property and the lot is bordered by a condo building and the Chicago River. 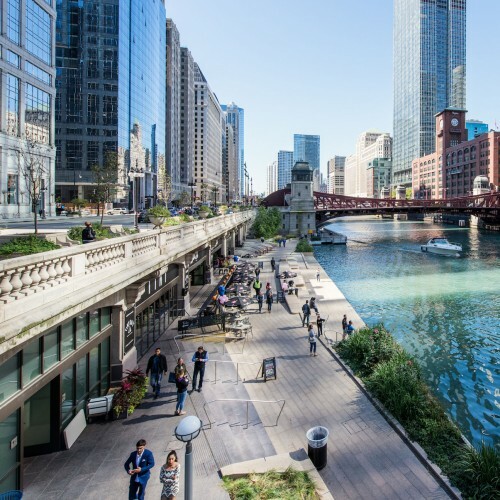 The tracks, combined with city easement and Riverwalk requirements, absorbed more than 75 percent of the property, leaving a buildable site that measured only 39 feet wide. In 2012, Riverside Investment and Development purchased the land and pledged to create a unique building along the river. Architects from Goettsch Partners and engineers from Magnusson Klemencic Associates (MKA) took on the challenge to squeeze what would become a nearly 1.5 million square foot building onto the compact site. With such a small footprint of buildable space at street level, the architects and engineers needed to develop an innovative solution that still allowed for large rentable office floors to generate income. The result is a 54-story skyscraper that defies typical structural logic. It’s common for tall buildings to have a wide base that gives stability to the foundation and then narrows at the top—think of the John Hancock Tower, for example. But it’s quite unusual for a tall building to be narrower at the bottom and widen at the upper floors. Yet, that is exactly the type of structural gymnastics Goettsch and MKA pulled off. The building rises on a very small base, which slopes outward at an angle for the first eight stories, then widens to nearly the full width of the site. To accomplish this feat, the designers chose a core supported structure, a massive central concrete “spine” that holds the elevator core and also transfers the load of the upper floors down to the foundations. 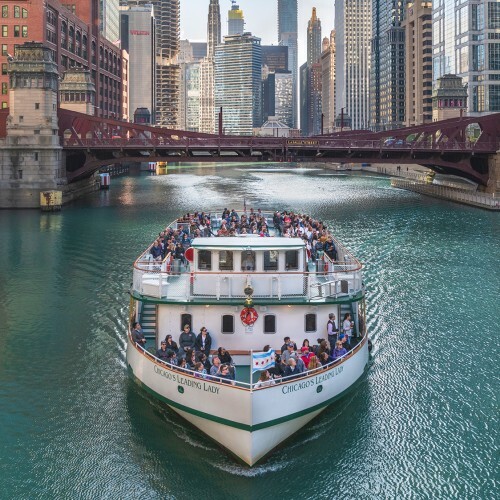 Caissons were drilled more than 110 feet below grade level and sunk 5 feet into Chicago’s bedrock to provide a stable foundation in Chicago’s swampy soil. During construction, the building’s location along the river was considered an asset, rather than a liability, when 81 floating barges were tied together to hold a 2 million pound crane that lifted the giant steel trusses. In addition, the largest and longest hot-rolled steel beams ever used in the U.S. allowed the building’s width to splay out from 39 feet to 120 feet. Given its unique design, the building has a foundation that could support a building twice as high, according to the architects. 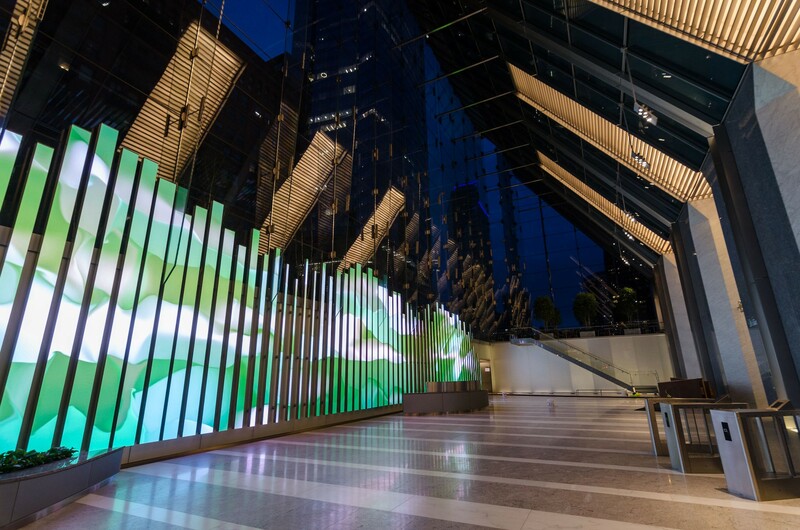 A full-time creative director/curator was hired to find Chicago artists and teachers who could provide artwork for the digital projections seen in the lobby. According to the building’s architects and engineers, the mega-columns on the north and south sides of 150 N. Riverside could support the weight of 26 fully loaded and fully fueled 747 jets. The slenderness ratio of the building (the building’s height relative to the width of the core) is 20:1. The average skyscraper ratio is 12:1. On the building’s exterior, vertical metal fins—inspired by the rippling of wind-swept water—help to cool the building by providing shading. 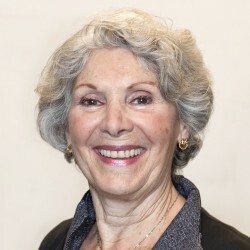 The building’s many environmentally-friendly features have allowed it to be pre-certified LEED-Gold, a designation given to resource efficient buildings. All tall buildings face the challenge of wind loads pushing on the structure, because the façade acts like a giant sail. 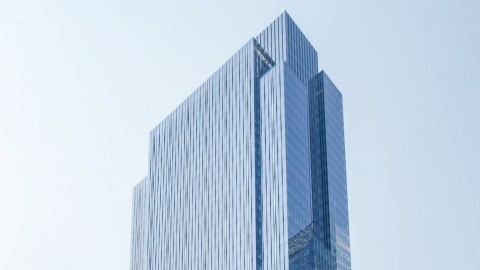 But with such a slender building resting on a smaller-than-normal base, the designers of 150 North Riverside had to use an innovative solution to help mitigate the motion of the building and provide a comfortable working environment for tenants on the upper floors. One method of reducing the sway in a tall building is to place a very heavy object – which also has the ability to move somewhat freely – at the top of the structure. When the wind pushes on the building one direction, the heavy object naturally moves in the opposite direction, helping to counteract the oscillation. Hidden in the upper floors of 150 North Riverside, several giant tanks—called “tuned liquid sloshing dampers”—hold 160,000 gallons of water. These special tanks of liquid help to dramatically dampen and reduce the building’s sway. Back at ground level, a cable net-wall of glass encloses a 110-foot tall lobby, which rests on the platform over the railroad tracks, blurring the boundaries between interior and exterior. 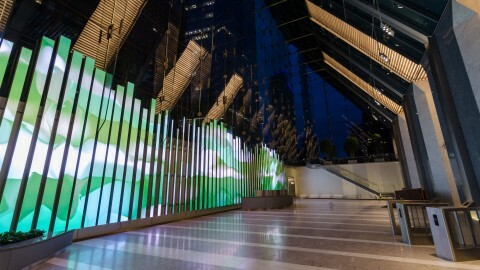 Inside, a massive LED display captures visitors’ imaginations with ever-changing art installations. Placing the building at the northeast corner of the lot and providing a transparent lobby softened the view for the neighboring building to the west and created a comfortable distance between the buildings. Outside, a landscaped park and riverfront promenade hides parking and provides green space for tenants and passersby. Gliding past 150 North Riverside on the Chicago Architecture Foundation’s River Cruise aboard Chicago’s First Lady, the building almost seems to reach out and embrace you. Guests can see themselves and the boat reflected back off the slope of this tulip-shaped tower. 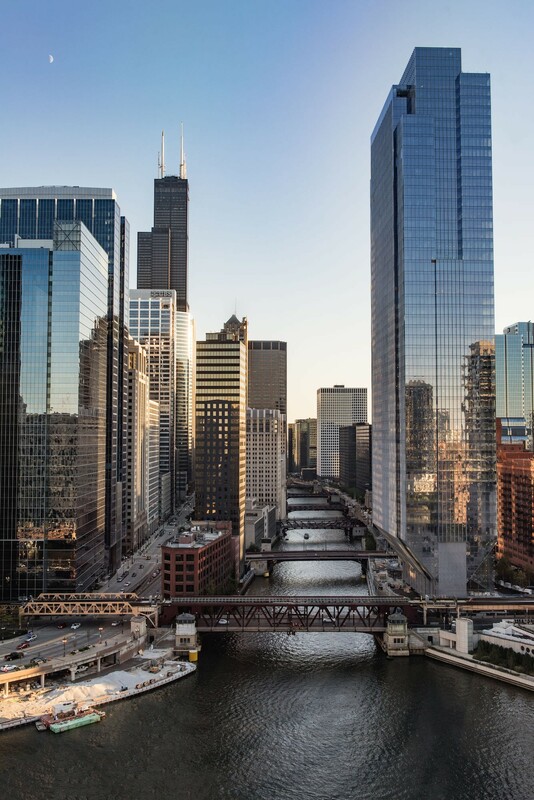 And then, as if just having freshly emerged from the water, 150 North Riverside rises up in shimmering glory to its 54-story height, offering picturesque reflections of the river and surrounding buildings. 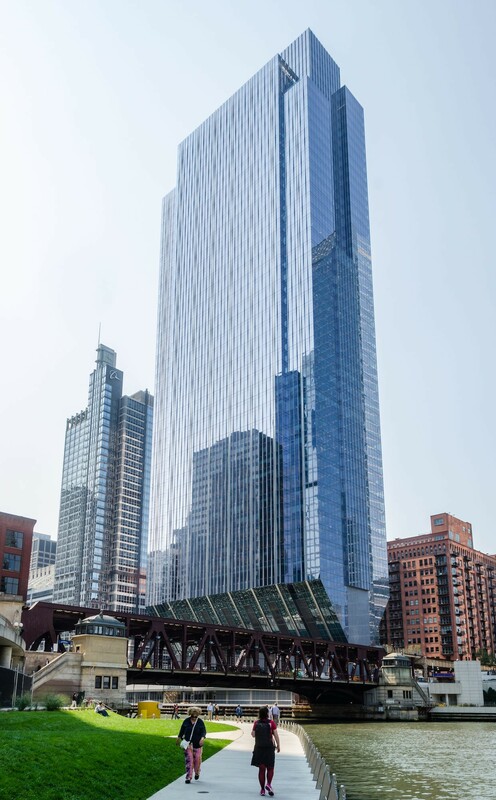 As 150 North Riverside takes its place among Chicago’s great architecture and engineering marvels, it also illustrates how new technologies and creative solutions can be used to solve decades-old problems, including building skyscrapers on tiny lots previously considered “unbuildable.” Completed in 2017, the building joins River Point and Wolf Point West at the confluence of the north and south branches and main stem of the river. 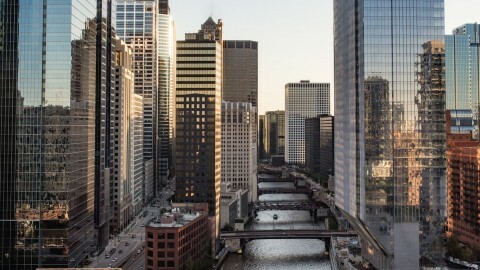 This trio of skyscrapers has dramatically changed the look of the Chicago’s riverfront.